This is probably one of the most complicated recipes I have ever made. It is probably also one of the most delicious. It's the apple dumpling we know and love, transformed into bite size form! I recommend that you completely read through the recipe before you start. It isn't a difficult recipe, but it does have a lot of steps. Melt the butter in a sauté pan over medium heat. Add maple syrup, lemon, and cinnamon and stir to combine. Add the apples and sauté until apples are softened and all the liquid is evaporated. Allow to cool. Heat butter, maple syrup, cinnamon to a small sauce pan and heat. Cook on medium for about 20 minutes until the mixture thickens slightly. Remove from heat and allow to cool. Butter a 12-cup Bundt pan liberally. After dough has fully risen, punch down the dough and cut it into 64 pieces. With floured hands, flatten out a piece of dough, add a chunk of apple, and wrap the apple chunk like a dumpling so the apple is completely wrapped in dough. 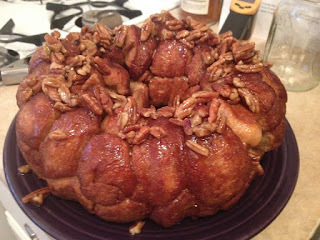 Dip the dumpling into the Maple Syrup Coating, and add it to the bundt pan. Repeat 63 more times taking care to stagger the dough balls to build layers. When all of the dumplings have been dipped and placed into the Bundt pan, put the remaining maple syrup coating into a container and refrigerate (you’ll be using the leftovers for the glaze). Cover Bundt pan tightly with plastic wrap and place in refrigerator. Approximately two hours before you want to bake your Monkey Bread, remove it from the refrigerator and let the dough come to room temperature and begin to rise. Preheat oven to 350°. Unwrap pan and bake until top is deep brown and caramel begins to bubble a little around edges, 30 to 35 minutes. Cool in pan for 5 minutes, then turn out on platter and allow to cool slightly, about 10 minutes. While the apple dumpling bread is baking, put the remaining maple syrup coating to a saucepan and add ½ cup of apple cider. Cook the glaze until it reduces into a syrupy consistency (about 20-30 minutes). Add the pecans and vanilla. Spoon mixture over the pull-apart bread after it has been removed from the Bundt pan. Boil maple syrup, cider, and corn syrup until it reduces by 3/4. When it's nearly finished reducing, heat the cream/milk, butter, cinnamon, and vanilla in the microwave for 30-45 seconds (This will help keep the sauce from breaking). Add the warmed milk mixture to the boiling cider/maple syrup and stir. Serve alongside the pull-apart bread for a little extra apple-y goodness.